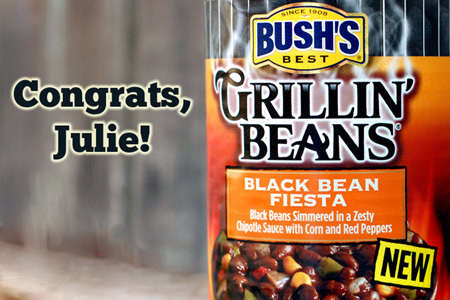 Congratulations to Julie Crim of Newalla, Oklahoma for being randomly selected as the winner of my giveaway, brought to you by Bush's Grillin' Beans! She won a great grilling gift pack valued at approximately $350. We don't exactly have a grilling masterpiece, we just slow smoke brisket and ribs over hickory. But I like to put the beans on the smoker too. Bourbon and Brown Sugar Bush's grilling beans are great, just drape some bacon on top and put them on the pit until they are cooked as you like them. Add some sweet potato fries and I'm totally happy! Your grilled pound cake looks amazing! Low-n-slow brisket and ribs with beans from the pit certainly rank as a masterpiece in my book! I hope you enjoy your prize, Julie. Thanks for your readership, your kind comment, and for entering. Thank you, and thanks to Bush's! Congrats Julie, If I couldn't win I'm glad that Dutch Oven is getting a good home.